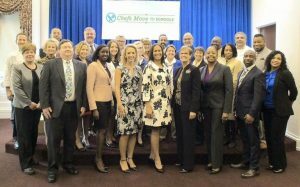 Three ICN staff, Acting Executive Director Aleshia Hall-Campbell (front, fifth from left), Education and Training Specialist Lois Coleman (front, third from left), and Web Developer Peter Cleary (front, second from left) with members of the Chefs Move to Schools Task Force in Washington, D.C.
Institute of Child Nutrition (ICN) Acting Executive Director Aleshia Hall-Campbell, Education and Training Specialist Lois Coleman and Web Developer Peter Cleary were among attendees of the Chefs Move to Schools Task Force meeting held at The White House on September 28, 2016. Task Force members included culinary educators, Chefs Move National Advisory Committee members, USDA staff, and school food service directors from around the country. The group met for two days and developed recommendations for the future of the initiative. The Chefs Move to Schools (CMTS) program is an integral part of First Lady Michelle Obama’sLet’s Move! initiative and its goal of helping kids lead healthier lives. Chefs can teach new culinary techniques and recipes for healthy meals that meet the federal meal pattern requirements. By creating healthy meals that are also delicious, chefs participating in CMTS have a unique ability to make good nutrition fun and appealing in the school environment. The Institute of Child Nutrition, part of The University of Mississippi’s School of Applied Sciences, has been working with USDA and The White House on this initiative since its inception five years ago. The Chefs Move program encourages chefs to join the fight against childhood obesity by adopting a school and working with teachers, parents, school nutrition professionals, and administrators to help educate children about food and to show them healthy eating can be fun. Working in partnership with USDA, ICN staff coordinate resources, news, and training, as well as maintain the Chefs Move website. For more information and news about Chefs Move to Schools, visit the website, chefsmovetoschools.org.